Termites - avoid fumigation and tenting your entire home. Why go through the stress of fumigating and tenting your entire home for termites? There is an effective alternative to tenting for termites. At Hubble Termite we offer a foam injection tip method that is very effective at killing termites in your home and it also less expensive. We know how much of an inconvenience having your home tented or treated for termites can be. Imagine not spending half a day bagging all of your food in the kitchen! That’s why we’ve developed a new process as an alternative to tenting and fumigating. Instead of fumigating your entire home, we’ll drill tiny holes along the interior of your walls and fill the wall voids with our treatment product. In fact, our stainless steel tips are smaller and sturdier than any others on the market at only 1/8″ wide – that’s the size of a nail head – leaving minimal patch work, and no leakage. With this method, we must simply drill along your interior walls at 16″ increments throughout the affected area, and pump our treatment product into the voids of your walls – completely eliminating the need for exterior tenting. Another great feature of this method is that it works well on Drywood or Subterranean termites. This is especially fantastic news if you have Subterranean termites as we would have previously needed to drill into finished flooring, and we can usually avoid that with this method. Do you own a pest control business? Would you like to offer this foam injection method to your customers? 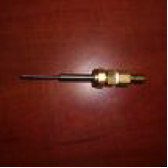 Contact us today to learn more about our Foam Injection tip method and how you can purchase this product for your business. We know your customers will love this alternative to fumigating! We now offer this foam injection method at our Bakersfield and Ventura County locations! Contact us today for a quote on your home, apartment or office, or to learn how your pest control business can use this termite fumigation alternative. For more information on Termites, treatments and inspections, click here.